Introduction to GlassFish application server v3. GlassFish v3 versions, installation and directory structure. Glassfish v3 daily administration tasks. Glassfish v3 Restful interface for monitoring and administration. GlassFish v3 JMX interface for administration and management. GlassFish v3 performance tuning tips. 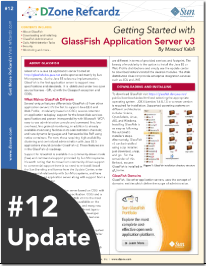 GlassFish v3 extendibility and extension points. The refcard includes several tables and illustration to describe different topics which will help with easier learning and remembering things.